Ah dear readers, there comes a time in every K-blogger's summer, when they feel the need to pop off out of the country and savour a little home time. It's my turn for the next couple of weeks, so you'll be getting a little taste of England. I hope you find this vaguely interesting, but if not, breathe slowly and deeply and come back in September. 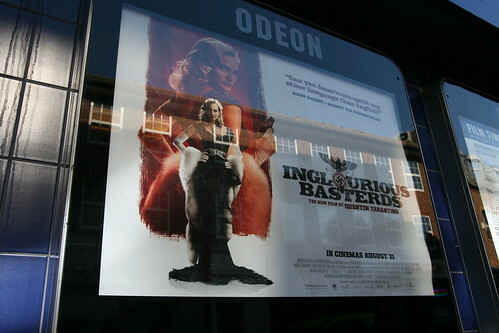 Wednesday, brought the joys and pleasures of Quentin Tarantino's new film "Inglourious Basterds". This two and a half hour epic reimagining of the second world war is both brilliant and a little frustrating. It's half an hour too long and little Quentin needs somebody to slap him on the wrist every time he forgets to press the edit button, but there are some remarkable performances along with a rather gripping, suspenseful story. Cristoph Waltz as Colonel Hans Landa the "Jew Hunter" steals the show with his gripping, creepy, yet slightly charming performance. He switched from French, to English to German and back again with such and ease and fluidity, that the mind boggles. Tarantino said that he couldn't have made the film without him and it's easy to see why. The other European actors have deliciously meaty roles and large parts of the film are conducted in French and German, giving a sense of authenticity sorely lacking from a lot of war films. Brad Pitt and the Basterds are entertaining, but the real heart of the story lies elsewhere. I fear saying to much, in case enjoyment is spoiled, but the story is not what I was expecting and Tarantino does not shy away from putting his stamp firmly into the war genre. I'm lucky I got to see this over here, so that I could enjoy the subtitles, without having to rely too much on my schoolboy French and German. I remember the joys and frustrations of Kill Bill as I tried to read the Korean subtitles during the Japanese sequences, or the quite surreal experience of watching Pan's Labyrinth with half an ear on the Spanish and half an eye on the Korean subs. So when it comes out in Korea I urge all of you to brush up on your French and German and take a chance on this long, but ultimately entertaining film.